AUBURN — It took her and her husband four hours to reach Auburn. On Sunday, Maggie Vanderweit, an award-winning quilter who's been practicing the craft for 40 years, made an appearance at the Schweinfurth Art Center to explain her quilting approach. Vanderweit, an Ontario, Canada resident, has work displayed and sold in Houston, Chicago, England and Johannesburg. 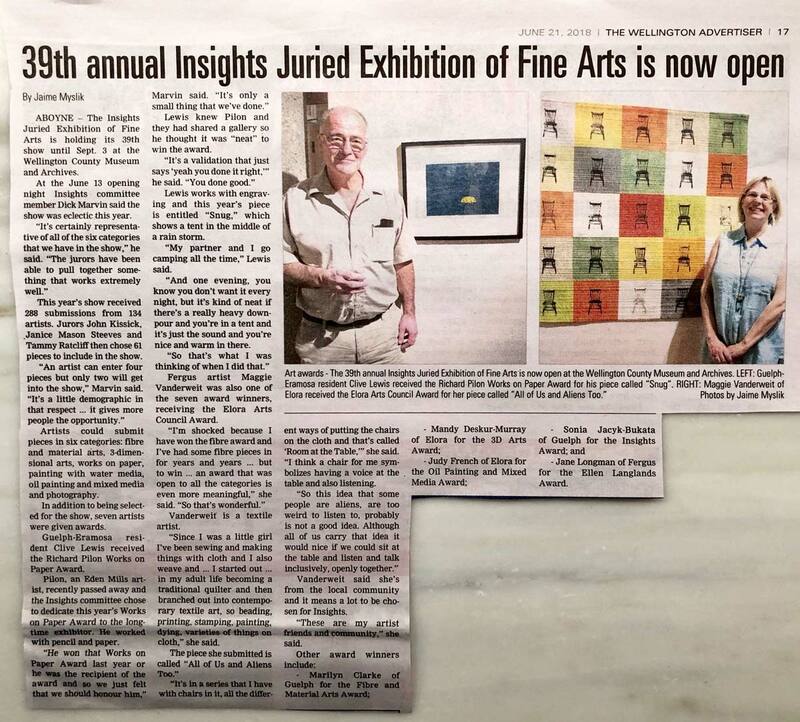 Her piece "All of Us and Aliens, Too" won the Shirley Hastedt Award and is featured in the Quilts=Art=Quilts exhibit at the Schweinfurth. This year the exhibit features 59 artists from around the world. Although she's skilled in traditional patchwork quilting — sometimes involving thousands of tiny fabric fragments — Vanderweit certainly isn't afraid to give a go at abstract work. A master at hand-painting and dying fabric, Vanderweit pieces together simple patterns. Then, like butter, she melts in elaborate designs to her quilts. "Allowing," a scarlet-stained piece Vanderweit presented Sunday, reflects her belief that people were meant to live joyfully. "We have to get out of our own way to allow good things to come," Vanderweit said. Cheryl Davids, of Auburn, a frequent Schweinfurth visitor, said she was very impressed with Vanderweit's presentation. "It's great to see all the different designs," Davids said. "Her (Vanderweit) quilts and the others in the exhibit give off strong tone." A recipient of many awards, Vanderweit said being in Quilts=Art=Quilts at Schweinfurth is a real "thrill." "This is a very good gallery," said Vanderweit. "It's been at the leading edge of great textile art for a really long time." 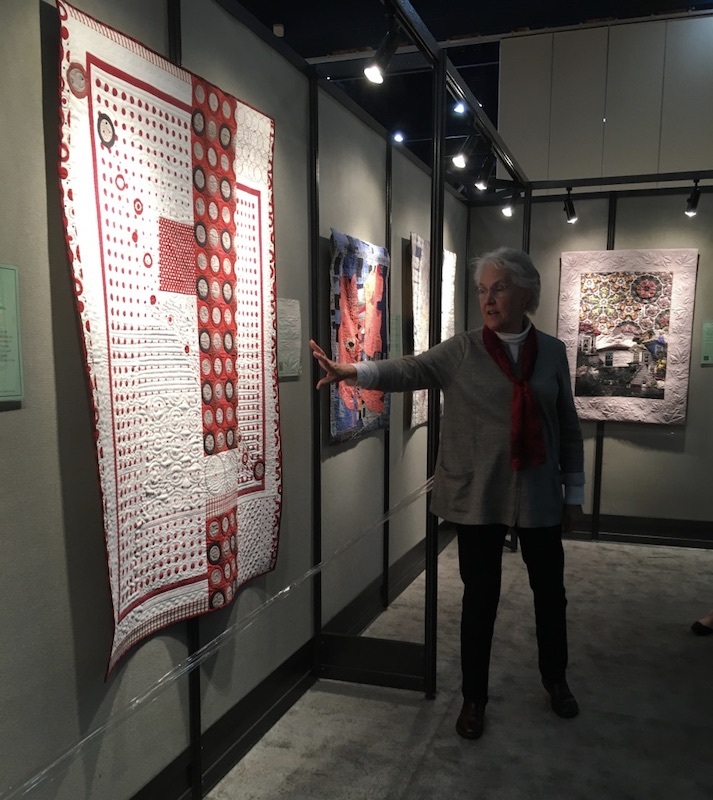 The Schweinfurth Art Center' Quilts=Art=Quilts will continue to be on display until Jan. 6, 2019. 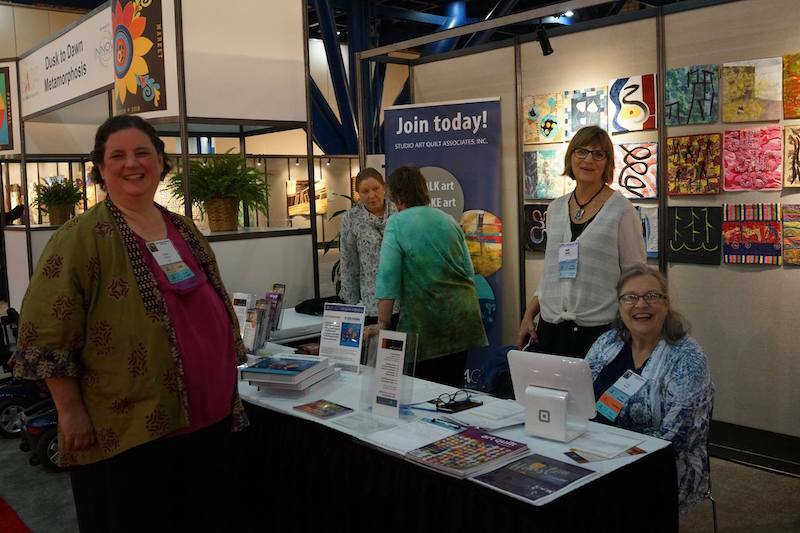 Quilt Festival Houston is always a whirlwind of excitement, and, as usual, SAQA and its members are a part of it all. The SAQA exhibition space is the hub for all SAQA activities. We can’t do it without the help of our volunteers! 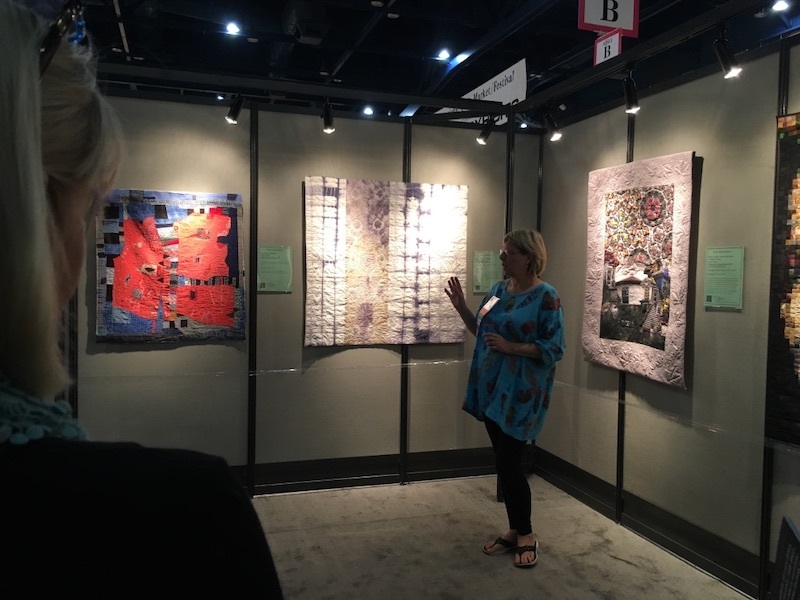 Art Quilts Unfolding debuted at Festival this year. The book is written by Martha Sielman, Nancy Bavor, and Lisa Ellis, and edited by Sandra Sider. Art Quilts Unfolding is part of SAQA’s Art Quilt Retrospective project. 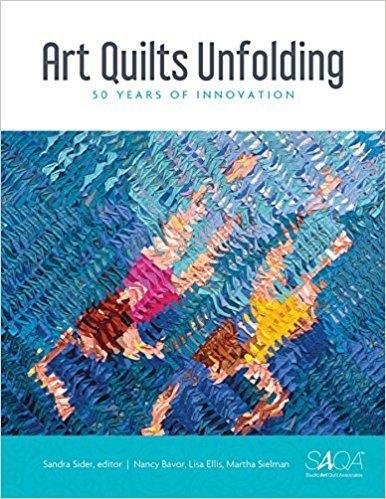 This comprehensive exploration of the first 50 years of the art quilt is also on sale in the SAQA Store. 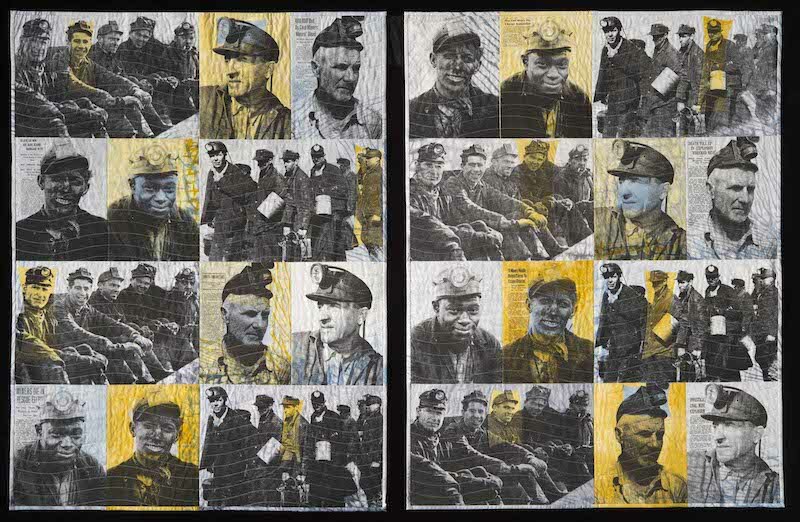 The companion exhibition – Layered & Stitched: 50 Years of Innovative Art – will premiere at Quilt Festival Houston in 2019. Our busy volunteers recruited 77 new members to our creative community. Welcome! 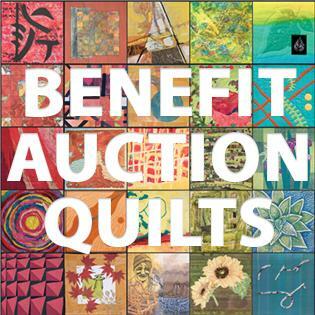 We sold 39 more Benefit Auction quilts which raises our fundraising total to more than $72,000. The remaining auction quilts will be back in the SAQA store later this month for those who are interested in purchasing them. We debuted two new Global Exhibitions—Dusk to Dawn and Metamorphosis. Thank you to our sponsor Innova for their continued support! Artist Maggie Vanderweit during the Metamorphosis Gallery Talk. 26% of the Global Exhibition quilts on display in these two exhibitions sold during Festival. SAQA also hosted several well attended gallery talks for both shows. Artist Rosalind S. Daniels during the Metamorphosis Gallery Talk. Our members were recognized in both Special Exhibitions and World of Beauty, the annual judged IQA Show. SAQA JAM Jill Kerttula was one of two artists featured in the Special Exhibition Rising Stars. Jill Kerttula giving an Artist Talk for her work featured in the Rising Stars Exhibition. SAQA JAM member Patricia Kennedy-Zafred’s piece Silent Canary received the Koala Studios Master Award for Innovative Artistry which carried a $5,000 cash prize. The SAQA Reception was a huge success with more than 120 people in attendance. On Sunday, volunteers and staff packed up the booth in good spirits. 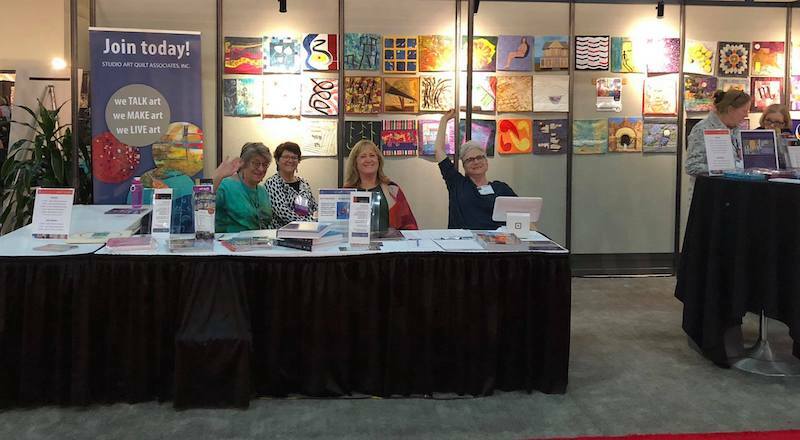 It was another successful Quilt Festival Houston. Thank you to all the folks who shared images on social media, stopped by the booth and said hello, and volunteered. We would not be the colorful, dynamic, engaging organization that we are without your help. Thank you! I am excited to announce that my work continues to be published! 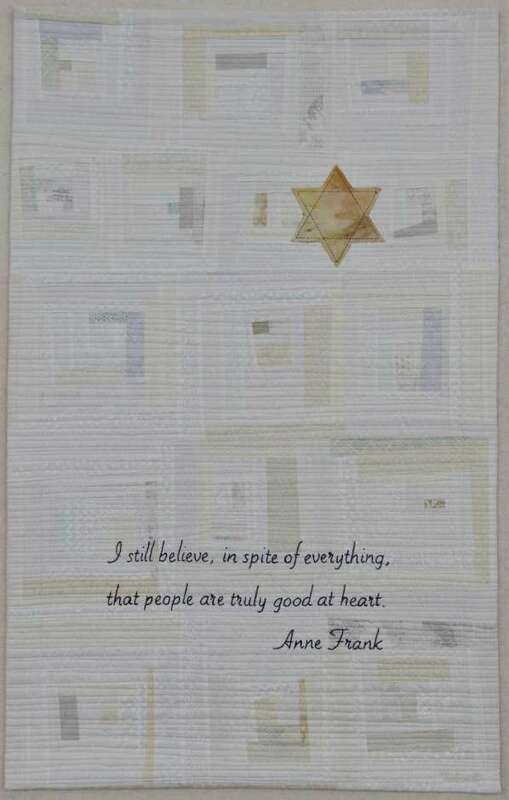 Maggie Vanderweit created her “Love Anyway” quilt — a simple gold Star of David on a pale traditional piecework background, finished with a heart-rending quote from Holocaust victim Anne Frank — long before the Tree of Life Synagogue massacre in Pittsburgh, but the timing isn’t lost on her. 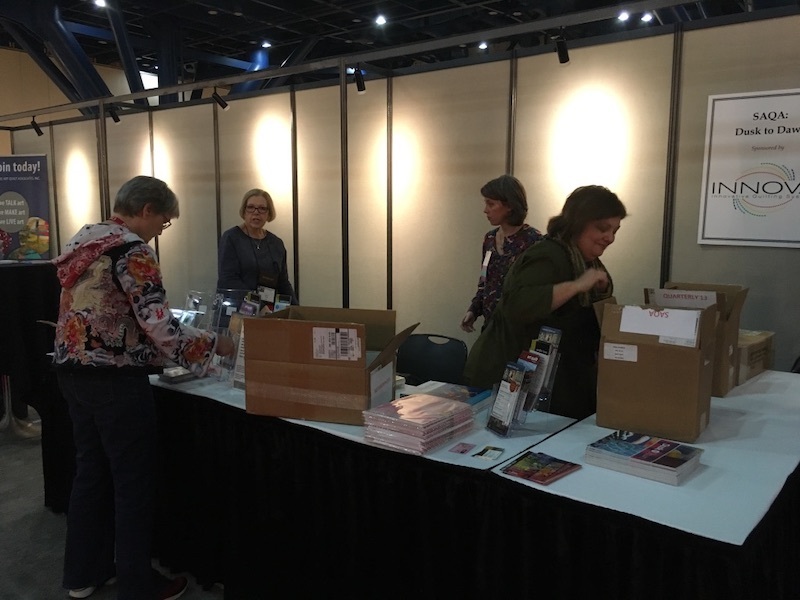 Our SAQA Central Canada Regional Representative, MAGGIE VANDERWEIT, has just been in Houston to share in the conversation around the exhibition and her personal story. You must make time to read the article posted in the Houston Chronicle, and walk through some of the histories, especially poignant are the words shared by Maggie and the story around her family. The link is below. Do take time to click through the photos. 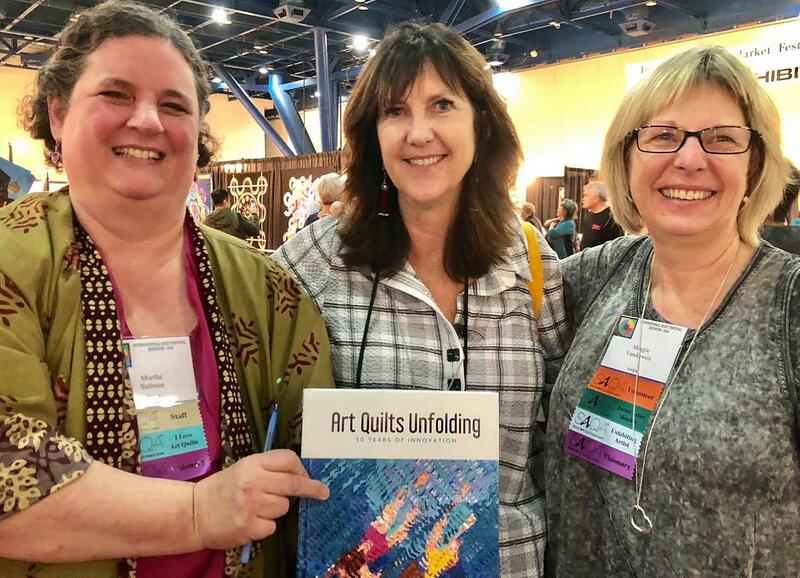 This lovingly crafted hard cover book includes: a deeply personal retrospective of a lifetime of stitching and almost 40 years of quilting; hundreds of photos and stories about the quilts I have made and why I made them: many practical and spiritual suggestions to deepen and energize your studio practice and keep your creative juices flowing! "Death Perceptions: A Community Explores Death Through Art"
Stone Threads Fibre Arts Studio"
She gave up a career as a French/ESL teacher to devote herself to the universe of the threaded needle. The Connections textile show is once more at the Wellington County Museum, reminding us of the remarkable upsurge of creativity in the textile arts which has emerged from traditional quilting, embroidery, beading and weaving. 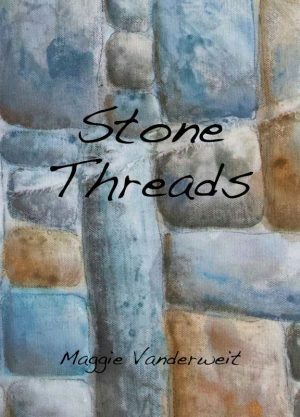 In textile shows across Canada and internationally, you will find the imaginative wall hangings of Maggie Vanderweit, created in her Stone Threads Textile Arts Studio, Fergus. In this purposely designed space, with glass doors giving onto trees and the Grand River, Maggie chooses fabrics, paints them, dyes them and quilts on her simple domestic sewing machine. Maggie says "One of the most important aspects of life is the tactile experience. We are wrapped in fabrics till we die. We live in all manners of textiles". In trips abroad such as a recent journey to South Africa, she has witnessed the new and the traditional roles of fabrics in daily life. 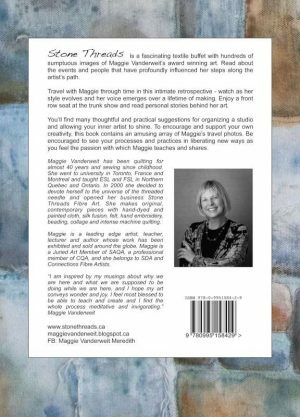 A remarkably successful artist, Maggie has energetically sought connections and markets for her work. She is a member of Silo Weavery, St Jacob's, the Grand Quilt Guild, Studio Art Quilt Associates (international), Canadian Quilting Association, Connections, CFUW Guelph Textile Art Group, and the Harris Artist Collective ECFTA. Her Studio can be visited on the Elora Fergus Studio Tour and she submits works to Insights, the national Creativ Festival in Toronto, and, in addition, Maggie teaches at the Haliburton School of the Arts, and in the Wellington County Museum Summer Art program. 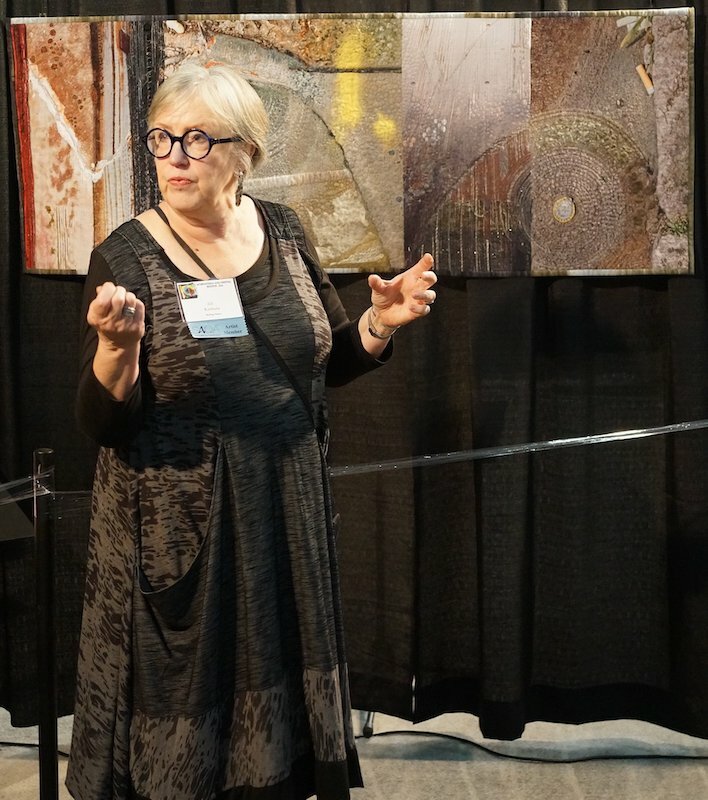 She enjoys presenting to quilting groups and guilds with Trunk Shows, and frequently lectures with demonstrations of techniques to fellow fibre artistssuch as Canadian Quilt Association members. Though she seldom holds courses at her home studio, groups who might like instruction in techniques listed on the Stone Threads website are welcome to request workshops. Maggie is of Dutch heritage. She started to knit & crotchet at a very young age, and to embroider in the Dutch tradition of embellishing even simple items with beauty. Her mother was always knitting or sewing, hands never idle. A woman who had a CAN DO approach to creativity, asking her children " what do you want?" Whatever was conceptualized, drawn or described, her mum would sew and make it. From 1976 to1980 Maggie studied French and English literature at University of Toronto, and in her third year went to a studio program at Aix En Provence, France. In 1992-93 she took a Diploma of Education at McGill, which led to work in northern Quebec for the Cree School Board, where she taught for three years, married into a Cree family to which she is still very connected, and had two children. 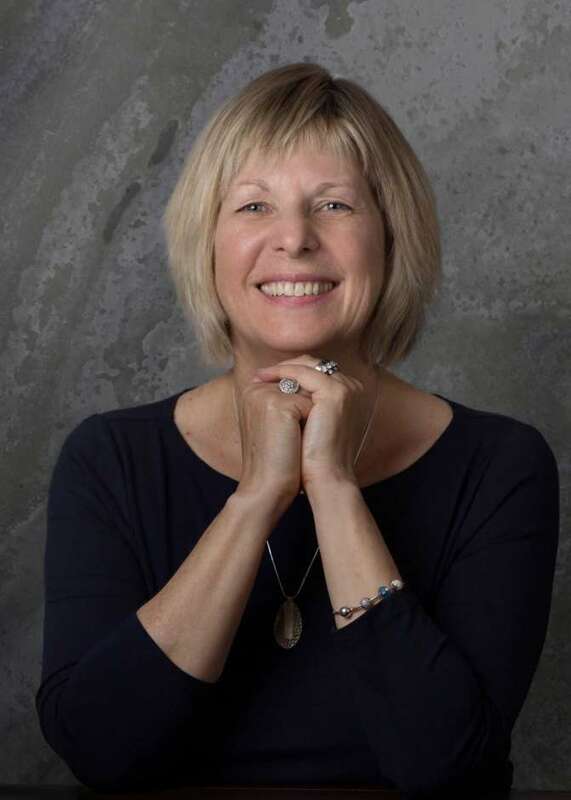 She has always searched for understanding and connection, and to know what its like to be in a minority, During the children's pre-school years, Maggie stayed home. At this time she began to explore traditional quilting, but using machine stitching. The early '90s saw the introduction of rotary cutters for fabric making it easy to cut patterns through multiple layers of cloth. Her proficiency and vision took her to new improvisations. She has the greatest respect for creativity and experiment, telling her pupils when teaching art "I have a magic wand" that would allow freedom of personal expression, but provided the students with a tool box of possibilities. Ever inventive, Maggie was possibly the first in this area to introduce Silk Fusion techniques, using silk rovings and silk paper laminates to embellish textiles. She also paints on fabric, stitching in relation to the patterns. She is now working almost exclusively with rust staining and botanical materials to dye fabric and create prints on wool. Her design wall is covered with white felt to which swatches adhere, making it simple to visualize the assembly of a piece.. The theme of her present exploration is "What Remains?" Everything is on earth for a short time, but after disintegration, a spirit is left here. Maggie's work seeks to capture the essence and spirit of substances. Origins of metal and plants may be gone, but their spirit remains: the rust from lids of paint cans, the chlorophyll dye of leaves, the fleeting colour of flowers and berries, they all stain patterns into the wool to later be machine stitched in reflective patterns. Speaking of her success, Maggie says she feels blessed to be able to follow a creative life. She has happily remarried a supportive husband and built a dream house in Fergus. With children leaving home, she has recently become an "empty nester', dealing with letting go; hands off parenting. Loving her children but allowing space. Her goal is to exhibit more internationally.Through her work she will continue to talk about emotional and social issues, and to explore. The above map is inscribed in stone near Lake Como, Italy It is called the Bedolina map. It marks the transition from a Hunter- Gatherer to an Agrarian society, cut into the rock at Capo di Ponti btween 8000 to 3000 years ago Maggie interpreted Bedolina in a monochrome quilted wall hanging which won the national award for excellence in innovation for the Canadian Quilt Association..
"I am inspired by my spiritual beliefs about why we are here and what we are supposed to be doing while we are here, and I hope my work conveys wonder and joy. I find the whole process of working with textiles meditative and invigorating and I feel most blessed to be able to teach and create". This beautiful book features moving images from a show that is travelling the world. "Talent Next Door - Cambridge Guelph & Area Volume 1"
This inspiring collection showcases a wide-ranging variety of artists living and working in Southern Ontario. Lots of eye-candy! see page 61 "Sacred Circles"
This is Sandra's fourth book in a fantastic series meant to delight, provoke, animate and spark textile artists of all abilities and interests. You will come away from any part of your reading galvanized and excited to try her ideas. Sandra designed this book herself and her skills as a graphic and textile artist and teacher shine from every page. I am so pleased and honoured to be included in this cast of many inspiring international fibre artists. Highly recommended. Click here to view my article in Sideroads magazine.